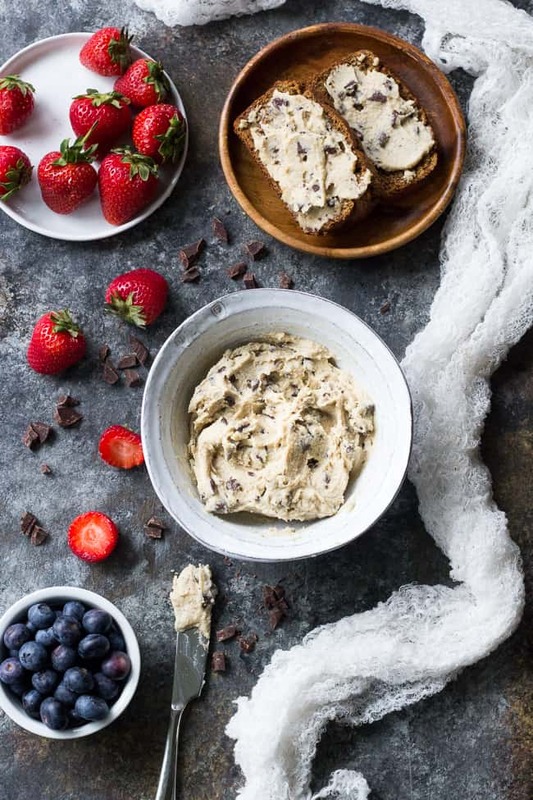 This super quick and easy cashew-based chocolate chip cheesecake dip (or spread!) is perfect for healthy sweet snacks and desserts. 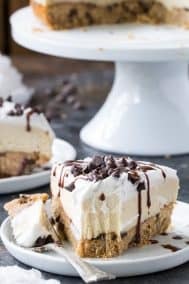 No need to make a whole cheesecake when a craving hits! This versatile dip/spread is dairy-free, paleo, vegan, and loaded with creamy texture and dark chocolate. Yes, I’m out of my mind WILDLY in love with all things cashew cheesecake. Long-walks-holding-hands- on-the-beach-at-sunset-in-love – that sort of thing. And you know I’ve never done that with any other food before (or, um, anyone) so I’m pretty sure this is serious. I think we’re coming up on a 4 month anniversary soon – maybe it’s time to plan something special, again. Anyway I might be slightly exaggerating re: being in love with cashew cream. However, I’m NOT stopping with it anytime soon, so if you’ve been resisting, now’s the time to cut the crap, soak some cashews and make magic happen! 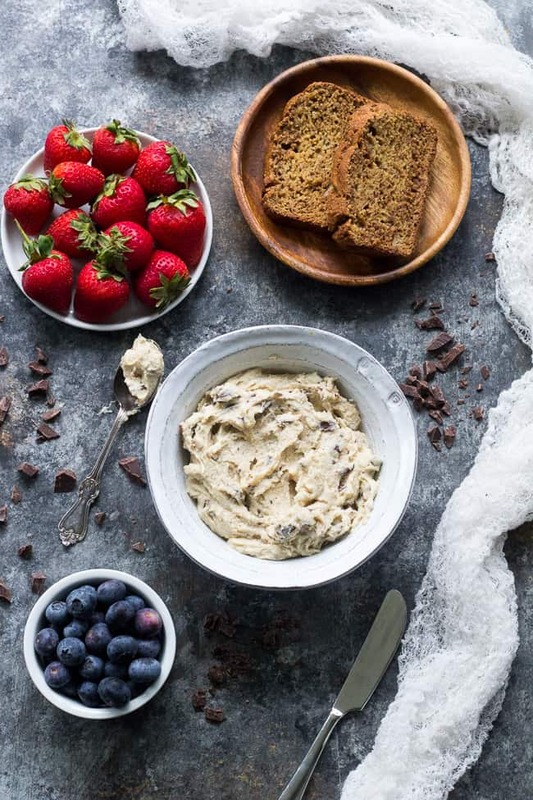 This chocolate chip cheesecake dip/spread is for all of you out there who want to try cashew based cheesecake, but honestly ain’t got time for making a whole flipping cheesecake. I don’t blame you! If you want to just go for the good stuff – here it is. The creamy, mysteriously-cheesecake-reminiscent-even-though-it’s-really-nuts, filling that’s the best part of the cheesecake anyway. Coming to a refrigerator near you so you can eat it with a spoon delicately dip your strawberries in it with dignity whenever you damn well feel like it. 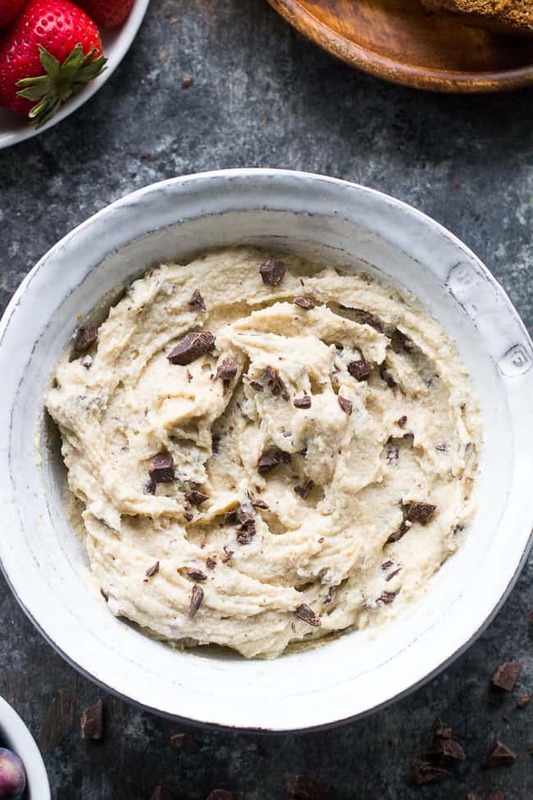 This dip comes together in minutes in a food processor or high speed blender, as long as you have your cashews soaked in water for at least 4 hours! 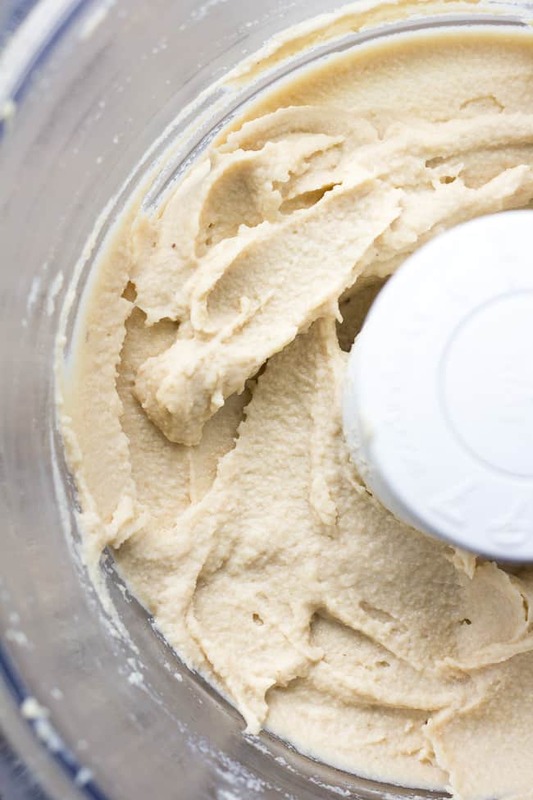 I am a terrible planner, but I DO remember to throw my cashews in water to soak overnight prior to making this or any other cashew cheesecake/frosting. It’s almost as easy to remember as turning on the dishwasher before I go to bed. Turn on dishwasher, soak cashews. I’m not capable of much after 8:30pm, but cheesecake is a big motivator for me. So, the details. 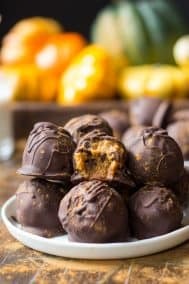 This recipe is completely Paleo and vegan, HOWEVER, for it to be truly and strictly paleo, you will need to use paleo chocolate. 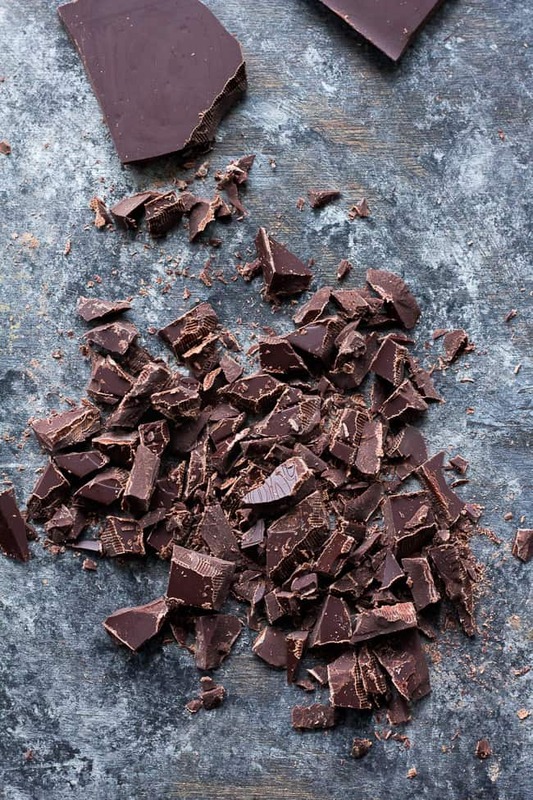 I’ll be honest – I don’t do this because it’s not a priority for me and I like the convenience of using my favorite dark chocolate bars OR Enjoy Life Dark Chocolate Chips. Paleo perfect is not necessary for me personally, but I do realize that many of you want no refined sugar in your lives whatsoever. 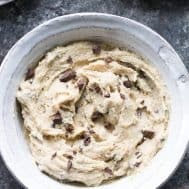 Add all ingredients EXCEPT the chocolate to a food processor or high speed blender, and process on high and/or pulse, stopping to scrape the sides as needed, until a thick creamy mixture forms. This might take several minutes (or not) depending on the type of blender or food processor you're using. 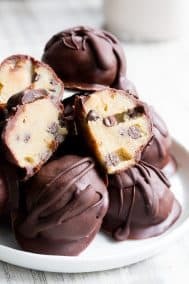 Once you have a thick, creamy, fully combined mixture, stir in chopped chocolate or chocolate chips, then chill for at least an hour for an extra thick, creamy texture. Serve with fruit as a dip, or spread on your favorite breads, muffins, crackers or cookies! Store covered in the refrigerator for up to 5 days. Enjoy! *For completely paleo chocolate (refined sugar free) you can make your own or purchase honey-sweetened dark chocolate. **PREP TIME includes the time needed to soak the cashews. 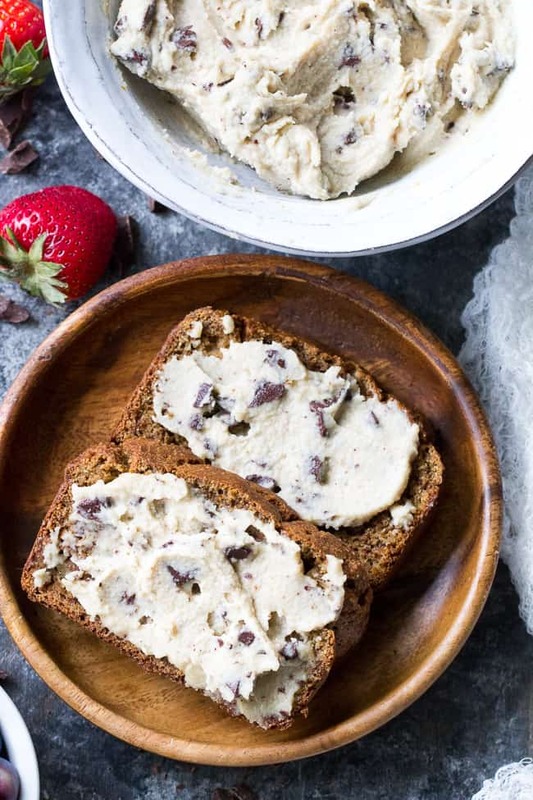 Want more paleo & vegan dessert recipes? Try one of these! What’s your current favorite dessert-y dip or spread? I’m such a sweet ‘spread’ person, and this sounds delightful on sweet bread or with strawberries or apples or any fruit for that matter. I totally need to try this today!!! It looks seriously amazing. Hope you tried it out! Sooo easy recipes and so yummy, everyone loves it, thank you!